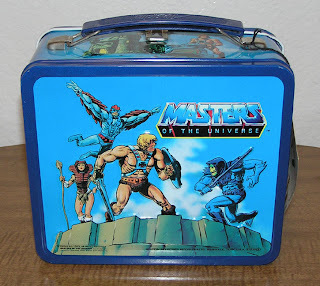 Once again the greatness of Ebay delievers me this Masters of the Universe lunch box. I now can carry my lunch to work with out dropping it all over the place. This is one of those authentic metal versions. I remember having a plastic one when I was a kid, but the imagery escapes me. I'm thinking that the blue Cyclone guy was on it, maybe Hordak? 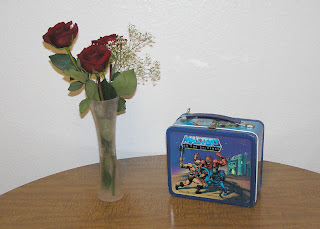 Or was it a pink My Little Pony lunch box? I can't remember. Also, I overheard a friend at work say that someone again has movie rights to MoTU and it is in the early stages. 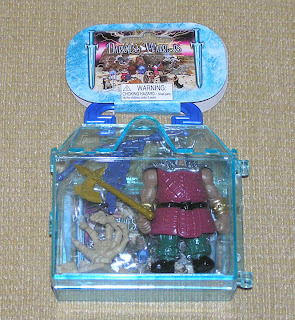 Hopefully it will be on Eternia this time with all the correct fixings. All though, who can forget the magic of that Voyager helmsman with that Friends actress teamed up with Daulf. 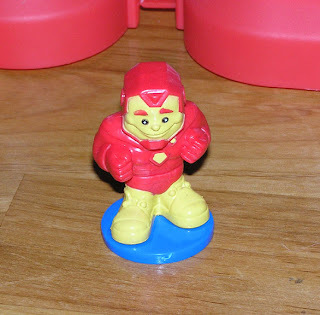 I usually don't find Knock-off or Pirated toys but on a quick grocery trip to Win-Co the other day, I found this guy looking strangely familiar. Isn't it nice to see toys displayed on my couch again? And do be alarmed, that skeleton hand coming out of the couch is not a toy!!! It tries to pull me into the cushions every time I watch Scrubs for some reason. 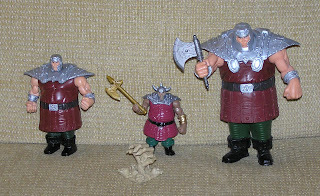 Anyhow, the guy in the middle sure looks like Ram-Man from the latest Masters of the Universe line. Or as my friend Joe would say, 'Medieval Kingpin'. 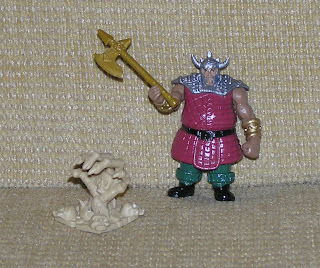 Although this fake Ram-Man doesn't have spring feet so maybe its just his cousin with horns on his head or something. Jeff strikes back with Spider-women #6 and #12 tieing the game! My calculations state that Josh solved Hulk, Ironman, Wolverine, Spider-man, and Thor. 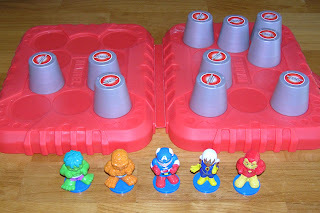 Jeff solved The Thing, Captain America, Storm, Cyclops, and Spider-woman. Thats five each! 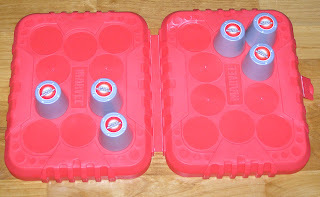 If you guys want a rematch, I suggest going to the store, buying the game, and hosting round 2 on your blogs. Ah, the empty board. Brings a tear to my eye. It was a well played game chronicled for the ages. Maybe next time we will play Mouse Trap or something. 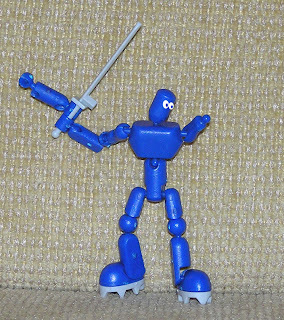 But for now, Im looking forward to going back and posting random toys and such. Thanks for Playing all! Josh has 5 correct, Jeff has 4... This could either end in a win for Josh, or a Tie for both! Things are on the wire now! Check your numbers again to see what is the final match. 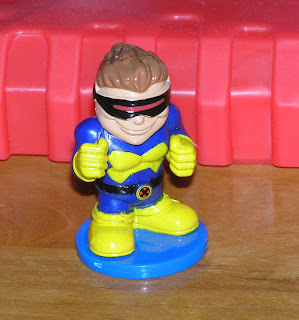 And yes, Cyclops was picked off by Jeff in round 7. 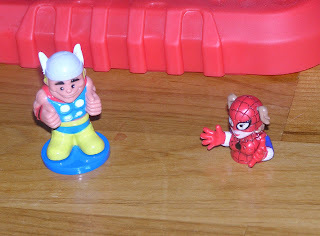 Josh matched #5 and #17 Thor! 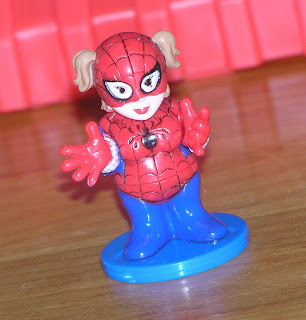 And #6 Spider-Women's top, Leaving one left on the playing field. Who will snag the last one? 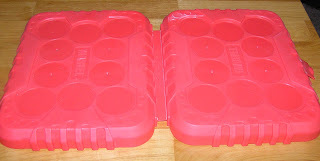 I shall then tally up the results and then melt all the pieces in the microwave! Jeff commented to see #5 Thors Top, #6 Spider-Woman's top and #10 Spider-Mans pants! 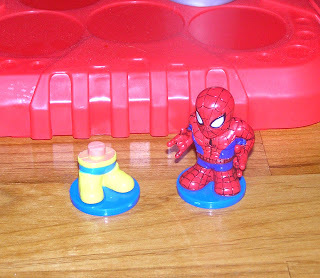 Sorry no match, And no you can't try and fit Spider-womans top onto Spider-mans pants. 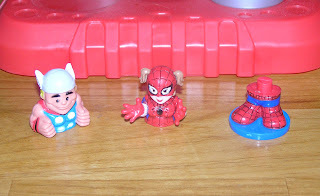 And Josh picked, #17 Thors Pants, #10 Spider-mans legs, and #11 Spider-Mans top!!! Ah a match indeedly. Josh ties things up with #4 wolverines pants and #18 Woverines top. Jeff Strikes back with #13 Cyclops Pants and #20 Cycolps top. This is what is left of the board. Who will pick the final three? Jeff leads with four, Josh has three, and Janet Reno has none. Josh built Ironman with #3 and #16. 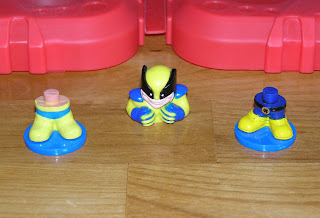 Jeff found out that #17 is Thors Pants, #18 is Wolverines top, and #13 is Cyclops legs. 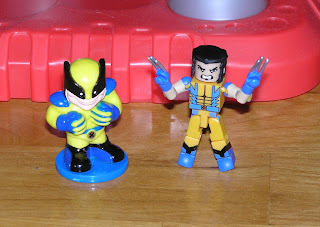 Sorry no match, even though it appears Wolverine could possibly fit into either one of those. Here's the field again. I begin to wonder what a cleaned off coffee table looks like?